Gareth Sansom was born in Melbourne and studied art at RMIT between 1959-64. He came to prominence as a figurative painter in Melbourne in the 1960s at a time of increasing abstraction, with influences ranging from British pop art to Francis Bacon. Sansom’s idiosyncratic drawings, watercolours, collages and paintings work straddle figuration and abstraction, and are based on a personal iconography that extends back over fifty years, and includes imagery of a sexual, philosophical and religious nature. His work defies narrative - despite the apparent randomness of the images, the artist’s formal and aesthetic ordering of them within the structure of the composition renders them whole. 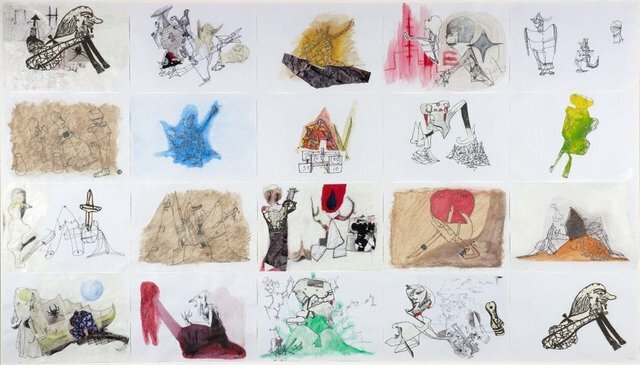 Works on paper – drawings, watercolours, photography and collage – have always been a key part of his practice - he represented Australia at the Seventh Triennial India in 1991, and won the National Works on Paper Award at Mornington Peninsula Regional Gallery in 2006, exhibiting watercolours in both. 'Made in Wadeye' is a suite of twenty drawings selected by the artist from a larger group of about forty made over a period of about eleven days in Wadeye, a remote Indigenous settlement south west of Darwin, in September 2012. Sansom spent two weeks in the town with his wife, a doctor, who had flown in for a month of clinical work. He walked the streets of the town, sometimes taking photographs, and observed and met the local people. The drawings were made in a pad of cartridge paper, disassembled once he returned to his Melbourne studio. To some, additional collage was applied, and then a selection of the final exhibited works made. Works on paper are a discrete and ongoing aspect of Sansom’s oeuvre – "They balance out my work, explain what I am doing" (interview with the artist and AGNSW, 19 November 2012). Occasional drawings are used to resolve problems in a painting; some are kept in a “collage box”, for possible re-use in future works. Sansom’s Wadeye drawings were made independently of any other work, a product of his time in the settlement, which was a dislocating experience of time and place. However, while Wadeye was the impetus for the series, it was not its subject; "I make stream of consciousness drawings with sources going back years" (interview with the artist and AGNSW, 19 November 2012). References to Wadeye are limited to a small hand-drawn map given to the artist by a local nurse, which he has added as collage in one of the drawings, and some earth, captured in egg tempera on paper. Signed and dated l.r. corner, black fibre-tipped pen "GS ‘12".